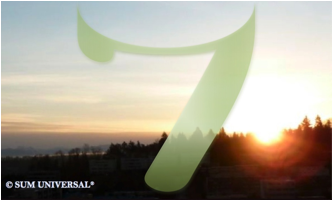 Number seven embodies the qualities of being clear-sighted, intuitive, meditative, sacred, and spiritual. Seven is the number of periods, or horizontal rows of elements, in the periodic table. The electrons of a chemical element occupy electron shells which surround the atomic nucleus. Just like the seven rows of the periodic table indicate, there are only seven known electron shells and/or possible energy levels (1-7). The amount of electron shells for each chemical element depends on each specific element and can contain only a fixed number of electrons. There are also only seven known types of energy/light rays: gamma, x-rays, ultraviolet, visible light, infrared, microwave, radio-waves. The chemical element that correlates to number seven is the non-metallic element nitrogen that makes up about 78% of the atmosphere by volume and is very inactive at low temperature. However, nitrogen compounds are vital components of foods, fertilizers, and explosives. Nitrogen, an essential component of all animal and plant life, is present in the proteins and DNA that are essential for all living creatures. Nitrogen atoms like carbon and oxygen form strong multiple bonds.